By 2019, 51 percent of network professionals surveyed by IHS Markit will use hybrid cloud and 37 percent will adopt multi-cloud for application delivery. Bandwidth consumption continues to rise. Companies are expecting to increase provisioned wide-area network (WAN) bandwidth by more than 30 percent annually across all site types. Software-defined WAN (SD-WAN) is maturing: 66 percent of surveyed companies anticipate deploying it by the end of 2020. Companies deploying SD-WAN use over 50 percent more bandwidth, than those who have not deployed it. Their bandwidth needs are also growing at twice the rate of companies using traditional WANs. Based on a survey of 292 network professionals at North American enterprises, IHS Markit explored the evolving requirements for enterprise edge connectivity, including WAN and SD-WAN. The study revealed that enterprise IT architectures and consumption models are currently undergoing a major transformation, from servers and applications placed at individual enterprise sites, to a hybrid-cloud model where centralized infrastructure-as-a-service (IaaS) complements highly utilized servers in enterprise-operated data centers. This process allows organizations to bring the benefits of cloud architectures to their own data centers – including simplified management, agility and scalability – and leverage the on-demand aspect of cloud services during peak periods. Respondents also reinforced the viewpoint that the hybrid cloud is a stepping stone to the emerging multi-cloud. Changing business demographics is sparking the trend of more centralized applications: enterprises are moving closer to their customers, partners, and suppliers. They are adding more physical locations, making mobility a key part of their processes and taking on remote employees to leverage talent and expertise. Following the current wave of application centralization, certain functions requiring low latency will migrate back to the enterprise edge, residing on universal customer premises equipment (uCPE) and other shared compute platforms. This development is still in its infancy, but it is already on the radar of some companies. Hybrid cloud is an ideal architecture for distributed enterprises, but it is also contributing to traffic growth at the enterprise edge. Extra attention must be paid to edge connectivity, to ensure users don’t suffer from slow or intermittent access to applications. Performance is a top concern, and enterprises are not only adding more WAN capacity and redundancy, but also adopting SD-WAN. The primary motivation for deploying SD-WAN is to improve application performance and simplify WAN management. The first wave of SD-WAN deployments focused on cost reduction, and this is still clearly the case, with survey respondents indicating their annual mega-bits-per-second cost is approximately 30 percent lower, with costs declining at a faster rate than in traditional WAN deployments. These results show that SD-WAN can be a crucial way to balance runaway traffic growth with budget constraints. SD-WAN solutions not only solve the transportation and WAN cost reduction issue, but also help enterprises create a fabric for the multi-cloud. Features like analytics to understand end-user behaviour, enhanced branch security and having a centralized management portal all make SD-WAN an enticing proposition for enterprises looking to adopt a multi-cloud approach. This IHS Markit study takes explores how companies are advancing connectivity at the enterprise edge, in light of new requirements. It includes traditional WAN and SD-WAN growth expectations, growth drivers, plans for new types of connectivity and technologies, equipment used, feature requirements, preferred suppliers, , and spending plans. SK Telecom, the largest mobile operator in South Korea, announces an agreement to partner with MobiledgeX to enable a new generation of connected devices, content and experiences, creating new business models and revenue opportunities leading into 5G (?). The relationship between SK Telecom and MobiledgeX reflects an aligned vision for the future of mobile operators as key players in future mobile application development, performance, security, and reliability. This vision is shared by leading cloud providers and device makers working with MobiledgeX to seamlessly pair the power and distribution of mobile operator infrastructure with the convenience and depth of developer tooling of hyperscale public cloud and the scale, mobility and distribution of billions of end user devices. “Deutsche Telekom created MobiledgeX as an independent company to drive strategic collaboration across the world’s leading telecoms, public cloud providers, device makers and the surrounding ecosystem – enabling a new era of business models, operating efficiencies and mobile experiences. We are particularly excited to announce SK Telecom‘s participation in this collaborative ecosystem where everybody wins. SK Telecom is a global leader in 5G which follows their rich tradition of innovation within their network, strategic partnerships and developer engagement. This new era is underway,” says Eric Braun, Chief Commercial Officer of MobiledgeX. MobiledgeX is focused on delivering developer-facing edge cloud services and bringing mobility to those services, dynamically placing application back-end as close to mobile devices as possible and removing them when not needed. MobiledgeX, Deutsche Telekom and Intelhave partnered with Telecom Infra Project (TIP) to form an Edge Application Developer project group (see here) to ensure the gained insights and supporting source code are available to all. This is a new opportunity for everyone presented as a consequence of $2 trillion of CAPEX investment in network infrastructure over the past 10 years and the virtualization of the network from the central offices to the towers. MobiledgeX is building a marketplace of edge resources and services that will connect developers with the world’s largest mobile networks to power the next generation of applications and devices. MobiledgeX is an independent edge computing company founded by Deutsche Telekom and headquartered in Menlo Park, California. Separately, SK Telecom said it will comply with the IoT Security Guidelines proposed by GSMA for the safe usage and expansion of IoT networks. Ericsson and SK Telecom have conducted a video call over the operator’s live 5G test network, the latest milestone in a long-running partnership. On this occasion, the companies used 100 MHz of 3.5-GHz spectrum, marking the first time that so much spectrum in this band has been used in a field test. SK Telecom used Ericsson’s commercial radio equipment, based on the 5G New Radio (NR) standard. Ericsson also supplied a test device equipped with Qualcomm’s Snapdragon x50 5G modem. As well as a video call, SK Telecom also demonstrated streaming via a 5G data session. As has been well documented, South Korea is pushing hard to be a frontrunner on 5G, which might explain Ericsson’s keen involvement with SK Telecom’s research and trials. The two companies have been at the forefront of testing out network slicing, where an access network is subdivided into virtual partitions, with the parameters of each one tailored to meet the requirements of specific services, from low-bandwidth massive IoT connectivity, to low-latency, high-throughput A/VR services. 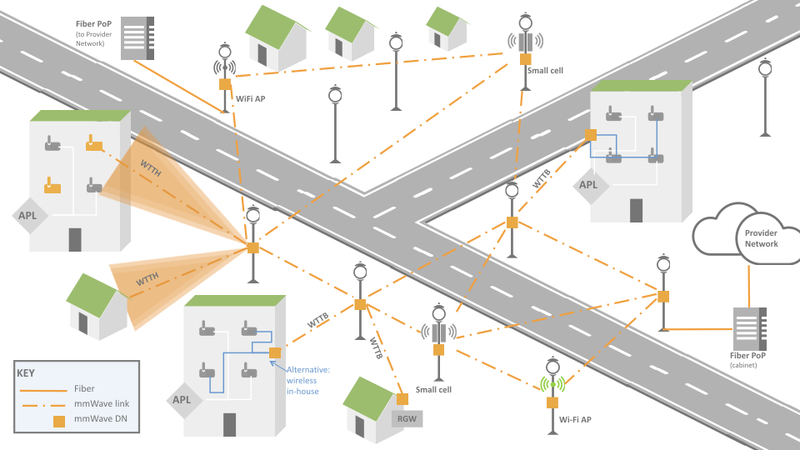 Ericsson and SK Telecom have also trialled multi-vehicular 5G trials in partnership with BMW. Another explanation for Ericsson’s close involvement with SK Telecom might have something to do with Samsung. The Korean vendor missed the boat on 4G when it backed WiMAX instead of LTE, but it is making a concerted effort to not be left out of 5G. Last year, it unveiled its end-to-end 5G portfolio, and it has struck important partnerships and supply deals, including with SK Telecom, Telefonica, and Verizon. With South Korea expected to be among the first movers when it comes to 5G commercialisation, Ericsson will want to make sure SK Telecom’s network is adorned with as much of its equipment as possible. The test environment was realized by using an Ericsson 5G field trial network. It consists of multiple radio transmission points on 28GHz frequency band to cover the entire track and one user equipment installed in every car. The trials showed consistent Gbps-level throughput with a few millisecond latency. Uninterrupted connectivity, using beam tracking and beam transfer across the different transmission points at speeds exceeding 100 kilometers per hour is also achieved. The performance shown enables multiple connected car use cases such as augmented and virtual reality, obstacle control and vehicle to vehicle communication, based on a system solution including radio and core network infrastructure from Ericsson. Edge computing will get its primary propulsion from demand for video services, IHS Markit found in a survey. The Linux Foundation commissioned IHS Markit to identify the top apps and revenue opportunities for edge compute services. Video content delivery was cited by 92% of respondents as the top driver of edge computing, while augmented/virtual reality, autonomous vehicles and the industrial internet of things (IIoT) all tied for second place. During a keynote address at this week’s Layer123 SDN NFV World Congress at The Hague, IHS Markit’s Michael Howard, executive director research and analysis, carrier networks (and a long time colleague of this author), presented some of the results from the market research firm’s survey of edge compute application survey respondents. IHS Markit defined edge compute as being within 20 milliseconds of the end user, device or machine. When compared to Internet Exchanges, telcos have an advantage at the edge because they are much closer to the users via their central offices, cell sites, cell backhaul aggregation, fixed backhaul and street cabinets. Integrated communications providers and over-the-top providers have partial coverage for edge compute with distributed data centers that are within the 20 milliseconds to 50 milliseconds range, while telcos can hit 5 milliseconds to 20 milliseconds. Among the top services that are driving edge compute, video content delivery, which included 360 video and venues, was first at 92% followed by a three-way tie among autonomous vehicles, augmented reality/virtual reality and industrial internet of things/automated factory all at 83%. Gaming was next at 75%, with distributed virtualized mobile core and fixed access in another tie with private LTE at 58%. Surveillance and supply chain management each garnered 33%, while smart cities was last at 25%. When it comes to which edge services will garner the most revenue, distributed virtualized mobile core and fixed access, private LTE, gaming, video content delivery and industrial IoT all tied at the top of the survey results. Supply chain management, autonomous vehicles and AR/VR tied in the next grouping while surveillance and smart cities tied for last. Consumer-driven revenue at the edge includes gaming and video content delivery networks while enterprise-driven revenues will include private LTE, industrial IoT and supply chain. Overall, many of the edge deployments will initially be justified by cost savings first followed by revenue-bearing applications. Edge compute apps will start out in limited or contained rollouts with full deployment taking years and investments across several areas, according to the survey. Although edge compute brings services closer to end users and alleviates bandwidth constraints, it’s complex. Even a single edge compute location is complex with elements of network functions virtualization, mobile edge computing and fixed mobile convergence technologies that can spread across hundreds of thousands locations. There are also authorization, billing and reconciliation issues that need to be addressed across various domains, which could be resolved using blockchain to create virtual ledgers. Further, there’s a long investment road ahead to fully deploy edge compute. Areas that comprise the top tier of investments for edge compute include multi-access edge compute, integration, edge connectivity (two-way data flows, SD-WAN services, low latency and bandwidth), 5G spectrum and engineering. Earlier this year, AT&T Foundry launched an edge computing test zone in Palo Alto, California, to kick the tires on AR, VR and cloud-driven gaming. As part of the second phase, AT&T Foundry is expanding its edge test zone footprint to cover all of the San Francisco Bay Area, allowing for increased application mobility and broader collaboration potential. IDC Directions is the market research firm’s annual conference, which always delivers an informative and actionable overview of the issues shaping the information technology, telecommunications, and consumer technology markets. IDC speakers look at the current state of various markets, cutting edge trends and future IT developments that are likely to result in transformation and change. This year’s event only had one session on networking which we cover in detail in this article. A total event summary is beyond the scope of the IEEE ComSoc techblog. As the edge plays host to a growing array of new applications, the focus ultimately turns to edge networking, which must deliver the requisite connectivity, bandwidth, low-latency, and network services for both enterprise and service provider deployments. Indeed, as IoT and other edge services proliferate, a one-size-fits-all approach to edge networking and network security will not suffice. In this session, Brad Casemore of IDC examined the diversity of network requirements and solutions at the edge, covering physical, virtual, and network-as-a-service (NaaS) use cases and application scenarios. According to IDC, the “Intelligent Edge” includes both the IT Edge (IT activities performed outside the data center, but within purview of IT) and the OT/Operations Technology Edge (embedded technologies that do not directly generate data for enterprise use, and are outside the direct purview of IT). That’s in contrast to the “Core,” which is the “IT Data Center” — an information aggregation facility that is located on the firm’s own physical premises, off-premises in a collocation facility, or off-premises at a virtual location such as a public cloud. As a result, the intelligent edge network is significantly contributing to automated network intelligence, in addition to providing wireless and wireline connectivity services. Enterprise IT is being challenged to provide access to public and private clouds while also maintaining secure and effective communications with regional offices and headquarters (usually through an IP-MPLS VPN). Enterprise WANs are not effective for Cloud access, because they lack agility, flexibility, and efficiency. As a result, a different Application Centric WAN architecture is needed. Brad proposed SD-WANs for this purpose, despite the reality there is no standard definition or functionality for SD-WAN and no standards for multi-vendor inter-operability or inter-SD-WAN connections (e.g. UNI or NNI, respectively). SD-WAN is an overlay network that provides user control via the Application layer, rather than via a “Northbound” API to/from the Control plane (as in conventional SDN). The use cases for SD-WAN have been well established, including improving application performance by enabling use of multiple WAN links, simplifying WAN architecture, reducing reliance on MPLS, and improving SaaS performance by automatically steering traffic based on application policy instead of back hauling all traffic to the data center. IDC believes the Internet of Things (IoT) will have a huge impact on networking infrastructure, especially at the edge where low latency/ real time control of IoT devices will be needed. Casemore said that SD-WANs will help companies overcome issues associated with a traditional enterprise WAN, which wasn’t built for cloud and lacks operational efficiently. IDC sees SD-WAN evolving to incorporate more intent based networking and intelligent automation, with business intent consistently applied to application delivery and performance, he said. Editor’s Note: Intent-based networking is a hot buzzword in the industry right now, generally describing technology that uses automation and machine learning to implement business policy with little or no human intervention. Many believe that intelligent automation will be how business intent is applied to application delivery and network performance across the WAN. ▪ Pervasive Security – Applications automatically steered over appropriate links and to appropriate security devices. Secure segmentation provided on a per -application basis. “This is all moving us toward the software-defined (SD)-branch. SD-WAN serves as the precursor and serves as the essential conduit to SD-branch and network as a service (NaaS) at the edge,” Casemore said. In the SD-branch, routing, firewall, and WAN optimization are provided as virtual functions in a cloud-like NaaS model, replacing expensive hardware. Management is automated and services can be easily adjusted as business needs change, Casemore said. IDC Prediction: Edge IT goes mainstream in 2022, displacing 80% of existing edge appliances. Consider the role and value of the network not just in terms of connectivity, but in how it can contribute to intelligence at the edge. Look for edge-networking solutions that abstract management complexity, provide application-centric automation, speed provisioning, and ensure application availability and security. Ensure your intelligent-edge network evolves to a NaaS model, in which virtualized network and security services are dynamically provisioned as needed. The edge network must be as agile as the apps/services it supports. Continually enhanced intelligent network automation and orchestration to reduce operational complexity and provide network agility. Leverage ML/AI as means to the end goal of providing increasingly actionable visibility that loops back to feed intent/policy and allows for proactive remediation. Provide for true NaaS at the intelligent edge, incorporating a full range of virtualized network and network-security services (through ecosystem partnerships). In her October 31st keynote at the Fog World Congress, Alicia Abella, PhD and Vice President – Advanced Technology Realization at AT&T, discussed the implications of edge computing (EC) for network service providers, emphasizing that it will make the business case for 5G realizable when low latency is essential for real time applications (see illustration below). The important trends and key drivers for edge computing were described along with AT&T’s perspective of its “open network” edge computing architecture emphasizing open source software modules. Author’s Note: Ms. Abella did not distinguish between edge and fog computing nor did she even mention the latter term during her talk. We tried to address definitions and fog network architecture in this post. An earlier blog post quoted AT&T as being “all in” for edge computing to address low latency next generation applications. Ms. Abella defined EC as the placement of processing and storage resources at the perimeter of a service provider’s network in order to deliver low latency applications to customers. That’s consistent with the accepted definition. “Edge compute is the next step in getting more out of our network, and we are busy putting together an edge computing (network) architecture,” she said. Above illustration courtesy of AT&T. “Size, location, configuration of EC resources will vary, depending on capacity demand and use cases,” said Ms. Abella. “It depends on the use case. We have to be flexible when defining this edge compute architecture. There’s a lot of variables and a lot of constraints. We’re actually looking at optimization methods. We want to deploy edge compute nodes in mobile data centers, in buildings, at customers’ locations and in our central offices. Where it will be depends on where there is demand, where we have spectrum, we are developing methods for optimizing the locations. We want to be able to place those nodes in a place that will minimize cost to us (AT&T), while maintaining quality of experience. Size, location and configuration is going to depend on capacity demand and the use cases,” Alicia said. Optimization of EC processing to meet latency constraints may require GPUs and FPGAs in additional to conventional microprocessors. One such application cite was running video analytics for surveillance cameras. Real time control of autonomous vehicles would require a significant investment in roadside IT infrastructure but have an uncertain return-on-investment. AT&T now has 12 million smart cars on its network, a number growing by a million per quarter. We need to support different connectivity to the core network and use “SDN” within the site. Device empowerment at the edge must consider that while mobile devices (e.g. smart phones and tablets) are capable of executing complex tasks, they have been held back by battery life and low power requirements. Device complexity means higher cost to manufacturers and consumers. Future of EC may include “crowd sourcing computing power in your pocket.” The concept here is to distribute the computation needed over many people’s mobile devices and compensate them via Bitcoin, other crypto currency or asset class. Block chain may play a role here. Fog computing is an extension of cloud computing which deploys data storage, computing and communications resources, control and management data analytics closer to the endpoints. It is especially important for the Internet of Things (IoT) continuum, where low latency and low cost are needed. Fog computing architecture is the arrangement of physical and logical network elements, hardware, and software to implement a useful IoT network. Key architectural decisions involve the physical and geographical positioning of fog nodes, their arrangement in a hierarchy, the numbers, types, topology, protocols, and data bandwidth capacities of the links between fog nodes, things, and the cloud, the hartware and software design of individual fog nodes, and how a complete IoT network is orchestrated and managed. In order to optimize the architecture of a fog network, one must first understand the critical requirements of the general use cases that will take advantage of fog and specific software application(s) that will run on them. Then these requirements must be mapped onto a partitioned network of appropriately designed fog nodes. Certain clusters of requirements are difficult to implement on networks built with heavy reliance on the cloud (intelligence at the top) or intelligent things (intelligence at the bottom), and are particularly influential in the decision to move to fog-based architectures. From a systematic perspective, fog networks provide a distributed computing system with a hierarchical topology. Fog networks aim at meeting stringent latency requirements, reducing power consumption of end devices, providing real-time data processing and control with localized computing resources, and decreasing the burden of backhaul traffic to centralized data centers. And of course, excellent network security, reliability and availability must be inherent in fog networks. The fog computing market opportunity will exceed $18 billion worldwide by the year 2022, according to a new report by 451 Research. Commissioned by the OpenFog Consortium, the Size and Impact of Fog Computing Market projects that the largest markets for fog computing will be, in order, energy/utilities, transportation, healthcare and the industrial sectors. Key market transitions fueling the growth include investments in energy infrastructure modernization, demographic shifts and regulatory mandates in transportation and healthcare. Cloud spend is expected to increase 147% to $6.4 billion by 2022. The fog market report includes the sizing and impact of fog in the following verticals: agriculture, datacenters, energy and utilities, health, industrial, military, retail, smart buildings, smart cities, smart homes, transportation, and wearables. Fog computing is the system-level architecture that brings computing, storage, control, and networking functions closer to the data-producing sources along the cloud-to-thing continuum. Applicable across industry sectors, fog computing effectively addresses issues related to security, cognition, agility, latency and efficiency. Download the full report at www.openfogconsortium.org/growth. New use cases created by the OpenFog Consortium were also released that showcase how fog works in industry. These use cases provide fog technologists with detailed views of how fog is deployed in autonomous driving, energy, healthcare and smart buildings. The OpenFog Consortium has announced that its OpenFog Reference Architecture will serve as the basis for a new working group formed by the IEEE Standards Association (IEEE-SA) to accelerate the creation and adoption of industry standards for fog computing and networking. This and other future standards on Fog computing and networking will serve as a significant catalyst to propel the digital revolution occurring as a result of advanced Internet of Things (IoT), 5G and embedded artificial intelligence (AI) applications. Fog computing and networking is an advanced distributed architecture that brings computing, storage, control, and networking functions closer to the data-producing sources along the cloud-to-thing continuum. Applicable across industry sectors, fog computing effectively addresses issues related to security, cognition, agility, latency and efficiency (SCALE). The inaugural meeting of the IEEE ComSoc Standards Working Group on Fog Computing and Networking Architecture Framework- Project P1934  is scheduled for November 2017, with its work expected to be complete by April 2018. Additional details were presented at two Fog World Congress sessions I attended on October 31st and November 1st in Santa Clara, CA (see below). The OpenFog Reference Architecture is a universal technical framework designed to enable the data-intensive requirements of IoT, 5G and AI applications. It is a structural and functional prescription of an open, inter-operable, horizontal system architecture for distributing computing, storage, control and networking functions closer to the users along a cloud-to-thing continuum. The framework encompasses various approaches to disperse information technology (IT), communication technology (CT) and operational technology (OT) services through an information messaging infrastructure as well as legacy and emerging multi-access networking technologies. During a November 1st late afternoon discussion on Fog/IEEE standards, Professor Zao said that in the future, the Open Fog Consortium would work with IEEE and other standards bodies/entities on other Fog computing standards. This author suggested that future Fog networking standards follow the CCITT (now ITU-T) model adopted for ISDN in the early to mid 1980’s: define the reference architecture, functional groupings and reference points between functional groupings. Then standardize the interfaces, protocols and message sets based on pointers to existing standards (where applicable) or new standards. Several attendees agreed with that approach with the goal of being able to certify compliance to exposed Fog networking interfaces. The Fog World Congress (FWC), to be held October 30th to November 1st in Santa Clara, CA, provides an innovative forum for industry and academia in the field of fog computing and networking to define terms, discuss critical issues, formulate strategies and organize collaborative efforts to address the challenges. Also, to share and showcase research results and industry developments. FWC is co-sponsored by IEEE ComSoc and the OpenFog Consortium. It is is the first conference that brings industry and research together to explore the technologies, challenges, industry deployments and opportunities in fog computing and networking. Don’t miss the fog tutorial sessions which aim to clarify misconceptions and bring the communities up to speed on the latest research, technical developments and industry implementations of fog. FWC Research sessions will cover a comprehensive range of topics. There will also be sessions designed to debate controversial issues such as why and where fog will be necessary, what will happen in a future world without fog, how could fog disrupt the industry. View the 5 track conference program here. The OpenFog Consortium bridges the continuum between Cloud and Things in order to solve the bandwidth, latency and communications challenges associated with IoT, 5G and artificial intelligence. Its work is centered around creating an open fog computing architecture for efficient and reliable networks and intelligent endpoints combined with identifiable, secure, and privacy-friendly information flows between clouds, endpoints, and services based on open standard technologies. While not a standards organization, OpenFog drives requirements for fog computing and networking to IEEE. The global nonprofit was founded in November 2015 and today represents the leading researchers and innovators in fog computing. For more information, visit www.openfogconsortium.org; Twitter @openfog; and LinkedIn /company/openfog-consortium. The rise of 5G is promising to shake up the status quo in the mobile equipment industry by presenting opportunities for startups to grab market share away from the incumbent vendors, according to ABI Research. In a new report, the market research firm identified 15 startups exhibiting strong potential to play a role in wireless network operators’ transformation to 5G through innovative products and services. “Traditionally operators have deployed a handful of infrastructure vendors in their networks, especially in the core network. Stagnating average revenue per user and increasing network traffic are driving operators to be more cost-effective and innovative in network performance and operations management and network upgrades. The end-to-end digital transformation toward virtualized and software defined networks is creating the opportunity for operators to open their highly proprietary networks and vendor ecosystem to include innovative start-ups. The 15 companies we have profiled illustrate a strong business sense and innovative solutions,” says Prayerna Raina, Senior Analyst at ABI Research. Operators are facing the need to address key network performance and traffic management issues ahead of the standardization and launch of 5G in 2020, the report states. Startups such as Athonet, CellWize, CellMining, AirHop Communications, Core Network Dynamics, Blue Danube and Vasona Networks are developing innovative solutions in these areas and may challenge the long-established telecom industry status quo. “The telco start-ups we have profiled are challenging the incumbents in every way. From the flexibility of the solution to value-added services and a strong R&D focus, these companies are not just innovative, but also reflect an understanding of telco operators’ operational models as well as revenue and network performance challenges. With strong financial backing and active engagement with major partners in their ecosystem, these startups have proven their ability to meet operator requirements in tests and field deployments,” Ms. Raina said. These findings are from ABI Research’s Mobile Network Hot Tech Innovators report. This report is part of the company’s Mobile Network Infrastructure research service, which includes research, data, and analyst insights. Technology trends including SDN and NFV for mobile networks, the evolution of the mobile edge computing and self-organizing network solutions will also lay the groundwork for 5G (even though none of those will be included in the ITU-R IMT 2020 standards). Other enabling technologies include the use of big data analytics (also not to be included in any 5G standard) to enhance and optimize network performance. Question: Do you really think start-ups can take market share away from Nokia, Ericsson, Huawei, Qualcomm, and other incumbent wireless technology companies? Don’t forget Intel which is making a major effort to be a 5G technology provider with their mobile terminal platform.